THIS IS A DEDICATED CONCERT BUS TO FLEETWOOD MAC. THE BUS WILL DROP ALL CUSTOMERS TO THE COACH PARKING IN THE RDS AND PICK UP FROM THE SAME LOCATION 45 MINUTES AFTER THE EVENT FINISHES. NOTE: AFTER PURCHASE, YOU WILL RECEIVE AN E-TICKET VIA EMAIL (NO PHYSICAL TICKET WILL BE SENT IN POST) E-TICKET MUST BE PRINTED OR STORED ON YOUR PHONE TO SHOW TO BUS DRIVER. 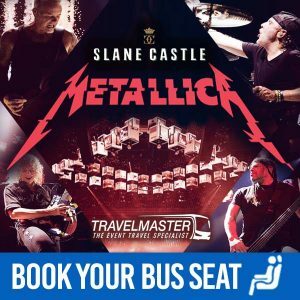 TravelMaster offer a Direct Return Bus to Fleetwood Mac from the following 16 counties: Cork, Kerry, Waterford, Tipperary, Limerick, Kilkenny, Carlow, Laois, Galway, Westmeath, Meath, Sligo, Leitrim, Longford, Mayo and Roscommon! Now you can take the hassle out of traveling to and from concerts. Relax and enjoy your trip in comfort on our modern coaches. How do I buy a ticket for a bus to Fleetwood Mac? After that, choose how many Bus Tickets you need. Save this eTicket on your phone or print it out and present the eTicket to the bus driver when boarding the bus to Fleetwood Mac. What are the benefits of taking a TravelMaster bus to Fleetwood Mac? Directly – We drop you outside and pick you up directly outside the concert. Our bus to Fleetwood Mac means no walking, and queuing for Luas or any other transport such as taxis or connecting buses. Quickly – Moreover We travel directly home shortly after the event has finished usually with one stop along the way. TravelMaster is The new, easy, and smart way to travel to concerts, festivals and events!